Is there a way to check start the httpd service so that I can access the Sen2Agri web interface? 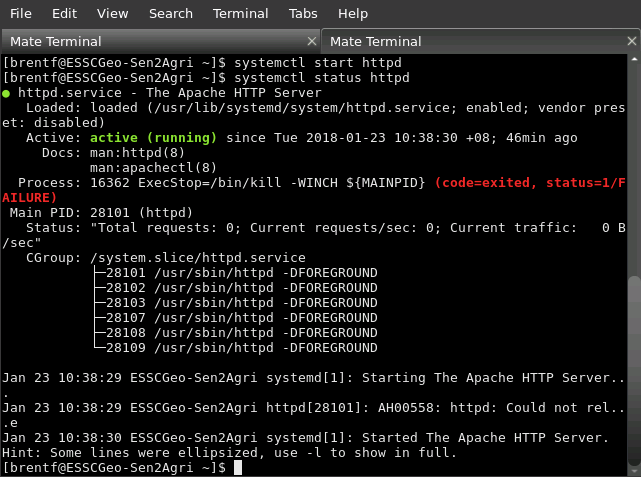 Jan 17 18:00:26 ESSCGeo-Sen2Agri kill: kill: cannot find process ""
Jan 17 18:00:26 ESSCGeo-Sen2Agri systemd: Failed to start The Apache HTTP Server. Jan 17 18:00:26 ESSCGeo-Sen2Agri systemd: Unit httpd.service entered failed state. Jan 17 18:00:26 ESSCGeo-Sen2Agri systemd: httpd.service failed. This question might be related to this post since this is the one I’m working recently. Changing the Apache port to e.g. 8001 or something else that’s available (you can check with ss as above) in /etc/httpd/conf/httpd.conf. Starting Apache (http) as described above. In the latter case, you should make a new file under sites-available and make a symlink to it under sites-enabled. If you have doubts, consider contacting your system administrator and passing them this post. After configuring nginx you can test the new configuration with sudo nginx -t and reload it with sudo systemctl reload nginx. For more information about setting up a reverse proxy, consult the nginx documentation. Anyway, I’m accessing this machine of mine through remote desktop (xrdp). We’re trying to maximize the specs of the said remote desktop, as we are limited by download speed, CPU and memory here in my country) I’m suggesting to my administrator to reinstall the CentOS itself, and then installing again the latest version of Sen2Agri. I’ll inform you of my updates and hopefully it will work. Cheers and again, much thanks. The issue is that you’re already running a web server on that system. To find out what it’s doing, you can simply open http://localhost/ from a Remote Desktop session. That web server was not installed by the Sen2Agri installer, and does not come with the system by default. I can’t tell why it’s there, but there must be a (good) reason. But yes, you can indeed pass this on to the system administrator if you have one. I seemed that our system administrator installed Only Office web server, being used by our institute. I’ll try to see what can I do about this. I followed your instruction and here’s the results. In the latter case, you should make a new file under sites-available and make a symlink to it under sites-enabled. This is somewhat confusing for me. Is this preferring to /etc/nginx/nginx.conf? or do I need to create a new directory? All right. There’s a warning (it doesn’t know the hostname), but it’s fine to ignore it. Yes, you should put that snippet in a file like /etc/nginx/conf.d/sen2agri.host.domain.conf. The error you’re getting is because the upstream and server blocks should be placed inside http. If you move it to a file in will be included there (see the include /etc/nginx/conf.d/*.conf; line. The advantage of this is that it’s easier to make modifications to a site without affecting the others. And you should replace sen2agri.host.domain with something more appropriate, like the server name (e.g. 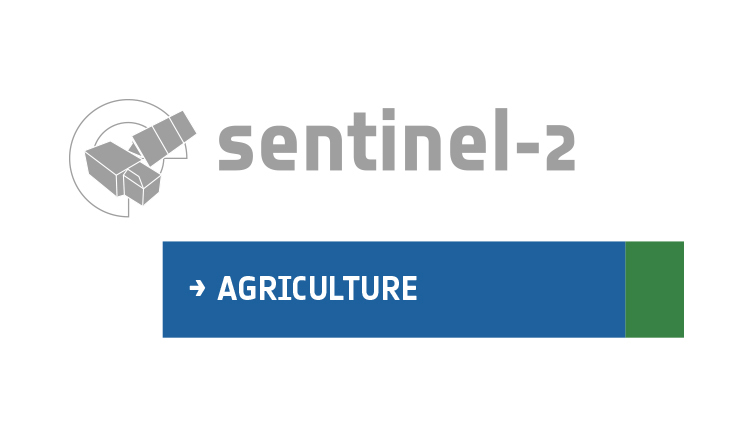 sen2agri.esscgeo-sen2agri.localdomain). You’ll either need a DNS entry (contact your network administrator for that) or, you’re accessing it from few computers you can add it to the hosts file. 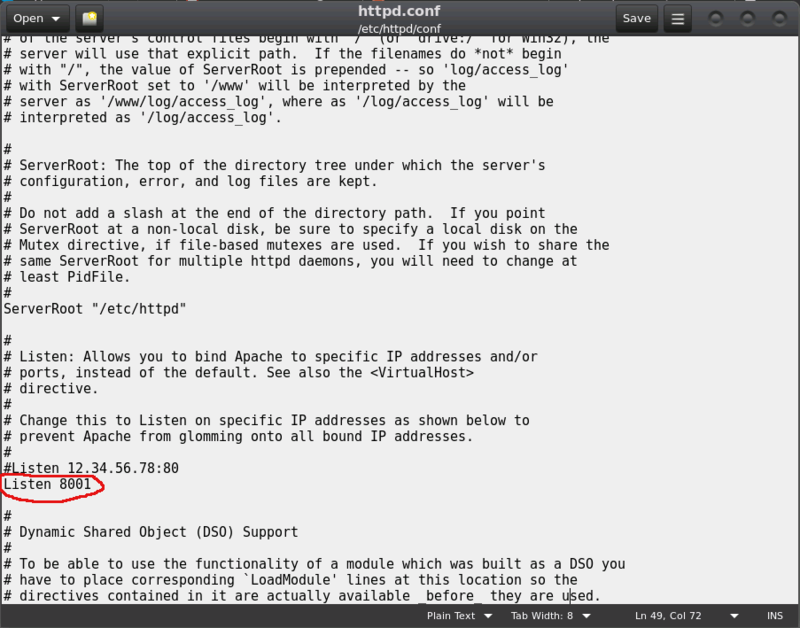 In the latter case, edit /etc/hosts (on Linux) and add a line with IP sen2agri.host.domain. Replace IP with the server’s IP address and sen2agri.host.domain with the name you chose before. nginx -t reported an error (because of the misplaced upstream block), so after the reload I suspect that nginx and Only Office are no longer working. To fix that, remove the two blocks you added and run systemctl reload nginx again. I followed all your advices, just want to share the outcomes. Reloading of nginx is also ok. However, I still wasn’t able to access the system’s web interface. I am sharing this post to my network administrator and update you in this post. All right. As a note, after the steps above, the web UI should be accessible at e.g. http://sen2agri.host.domain/. Feb 06 14:21:18 ESSCGeo-Sen2Agri kill: kill: cannot find process ""
Feb 06 14:21:18 ESSCGeo-Sen2Agri systemd: Failed to start The Apache HTTP Server. Feb 06 14:21:18 ESSCGeo-Sen2Agri systemd: Unit httpd.service entered failed state. Feb 06 14:21:18 ESSCGeo-Sen2Agri systemd: httpd.service failed. Also, the early edits I had in the /etc/ninginx/conf.d/ directory reverted back to their default values. it looks like it’s unable to connect to the Postgres database. Can you check its status? The connection parameters are set in /var/www/html/ConfigParams.php, you might also want to check that file. Feb 07 13:00:39 ESSCGeo-Sen2Agri pg_ctl: < 2018-02-07 13:00:39.237 +08 >HINT:  Is another postmaster already running on port 5432? If not, wait a few seconds and retry. Feb 07 13:00:39 ESSCGeo-Sen2Agri pg_ctl: < 2018-02-07 13:00:39.273 +08 >HINT:  Is another postmaster (PID 1590) using socket file "/var/run/postgresql/.s.PGSQL.5432"? Feb 07 13:00:40 ESSCGeo-Sen2Agri pg_ctl: Examine the log output. Feb 07 13:00:40 ESSCGeo-Sen2Agri systemd: Failed to start PostgreSQL 9.4 database server. 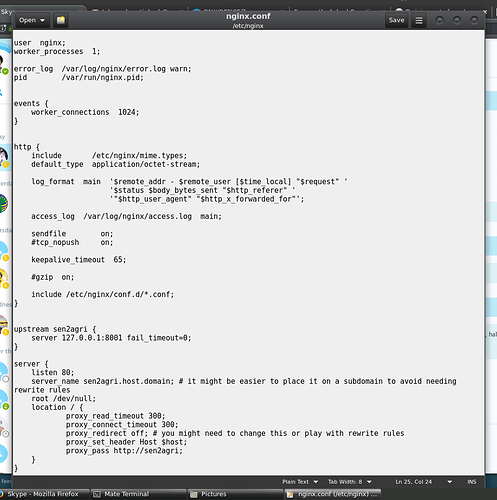 Feb 07 13:00:40 ESSCGeo-Sen2Agri systemd: Unit postgresql-9.4.service entered failed state. 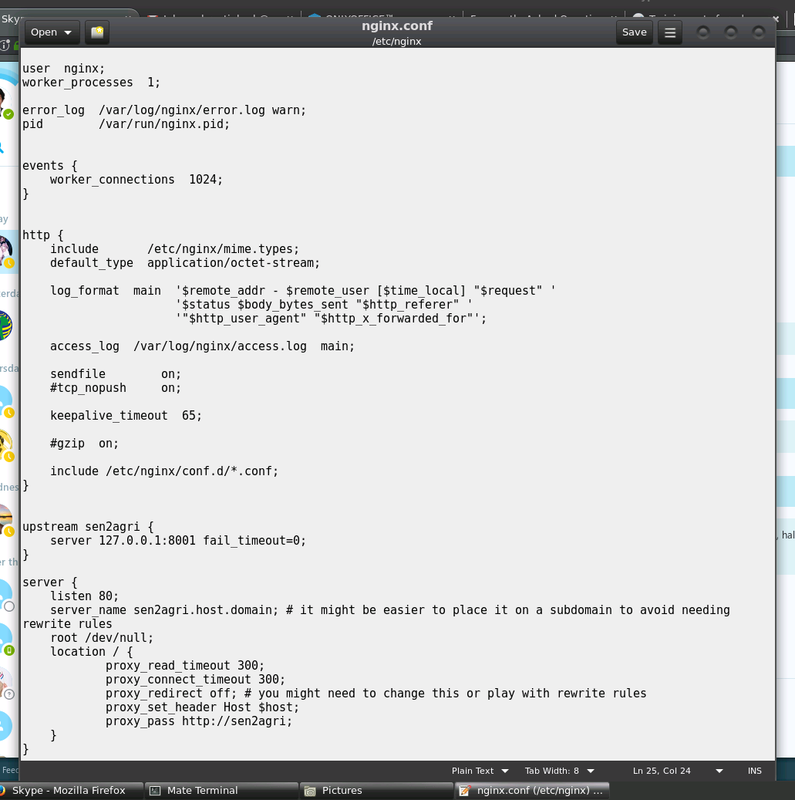 Feb 07 13:00:40 ESSCGeo-Sen2Agri systemd: postgresql-9.4.service failed. Yeah you’re right, another version of postgres was installed. Should I uninstall the other version of my postgres? 9.4 is ours. You should check what the old one is used for. I uninstalled all the packages of postgres 9.2 (it was updated automatically by the CentOS system) and successfully started the postgresql-9.4.service, but still can’t log in successfully in the web interface. Any suggestions?